When I posted "FO: Books in Spanish," I linked to a reprint of Noli Me Tangere in Spanish, but it was not the original edition printed in Berlin. Thanks to John Nery, I am now able to link to the original 1887 Spanish edition of Noli Me Tangere by Jose Rizal on Scribd, which may also be downloaded as a pdf file. Incidentally, a new English translation of Noli Me Tangere is now available as part of the Penguin Classics series. Hear Harold Augenbraum, the translator, explain his involvement with Rizal's book in an interview by Elda Rotor in a podcast on "José Rizal and the Novel That Sparked the Philippine Revolution." Unlike the original Spanish edition above, which is freely available, the Noli's new English edition and Augenbraum's forthcoming translation of El Filibusterismo (the sequel to the Noli) are available in print and eBook editions for a fee. Is Augenbraum's translation of the Noli better than previous ones? See what Nery has to say in "Erasing Ateneo" (Philippine Daily Inquirer, 16 June 2009). "The Filipino Librarian asked: Why is a the used with Philippines?" This reference by Eric Ambata to one of my very first posts in 2005 led to the discovery that Manuel Quezon III recently posted several links to my blog in relation to a discussion on whether "Philippines" is plural or singular. Then I learned that Gibbs Cadiz referred to a foreword I wrote for a book as a "succinct introduction," and even quoted a lengthy passage. We come into this life with nothing and we necessarily leave empty-handed. All that matters about whatever we win, earn, or acquire in the meantime is what we do with it, the good we make of it, the benefit we provide with it. I never thought of my KDOND experience this way, but what he wrote reminded me of an old post entitled "I'm Just Trying to Matter", where I asked "Why am I doing what I'm doing?" Thanks to Rev. Bentley, I am reminded that I do what I do not so my words can get quoted in blogs or newspaper articles, but so that others can benefit from whatever I have learned. For devoting 59 long years of her professional life in the development of the library profession; for her exemplary leadership as the First President of the Integrated Philippines Library Association now Philippine Librarians Association, as the Founding President of the Philippine Foundation for Library Science and Scholarship which gave 27 awards of recognition and distinction; for exemplifying the true meaning of commitment by sharing unselfishly her knowledge and expertise as Professor of UST, as delegate, speaker, lecturer and presenter of 28 papers in librarianship here and abroad and as a writer and publisher of articles in Library and Information Science Bulletin and Journals; and for her active and unrelenting involvement in community services such as medical missions, sports development for the youth, donation of books to the Quezon City Public Library, establishment of reading center for senior citizens, acquisition of hydrants in San Juan City and as Benefactor of Duyan ni Maria in Pampanga supporting programs of unwed mothers. 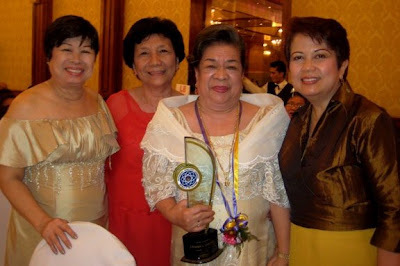 The awardee is joined in the photo by, from left: Nora Conti, Cora Nera and Beth Peralejo (Board for Librarians). The Encyclopedia of the Spanish-American and Philippine-American Wars is a new 3-volume set published by ABC-CLIO early this month. I haven't examined it thoroughly, and it's possible that it doesn't reflect the Filipino point of view, but I think the fact that its third volume is devoted to reproducing the texts of more than 150 primary-source documents will make it very useful. Some libraries probably have the earlier one-volume edition published in 2001, but it looks like this one is very different, starting with its editor. The full press release may be found at the website of the Library of Congress Asian Division Friends Society. The event is also on the calendar of the Philippine Embassy, Washington, DC.